As a researcher I have just published a few weeks ago a study with computerized systematics that, according to many immediate feedbacks and questions on systematics, often philosophical, has attracted a lot of interest. Here is the abstract: The phylogeny of the African genus Aphyosemion (Cyprinodontiformes, Nothobranchiidae) is reappraised based on the single global molecular tree (Collier, 2007). A data matrix of 24 groups comprising all known subgenera and "orphan" species and 91 external characters (body and fins shape, color patterns) is produced that is congruent with the molecular tree. The subgenus Mesoaphyosemion is confirmed as polyphyletic, its definition is restricted and 2 new subgenera are described, Scheelsemion n. subgen. and Iconisemion n. subgen. with the previously assigned species to Mesoaphyosemion being redistributed to the "old" and the new subgenera. The allied genus Episemion is also confirmed as nested within the redefined genus Aphyosemion and is considered as its subgenus only, with its components possibly to be reconsidered once the area, rich of atypical ("orphan") species is fully sampled. Why are the generic changes not automatically followed by Killi-Data like in the past ? This is the most frequently asked question to Killi-Data (see the newsletters 12 and 13), and not only for the Rivulus and the Simpsonichthys cases. Here with Aphyosemion the question is raised again. Has Killi-Data become over-conservative or rigid or even personal-minded or trying to impose a vision to everybody else, notably baring in mind that precisely Killi-Data had started in 2000 by pioneeringly stating that changes at the generic or species level will always be automatically followed if evidence based… therefore why not follow the split of Rivulus and Simpsonichthys and Aphyosemion ? The answer is simple and just a fact of life. In the past that pioneering -and objective- principle was thought necessary because conflicts between splitters and lumpers were culminating and they were based on opinions only (remember the Roloffia case, no matter of the I.C.Z.N. further decision, that is restricted to nomenclatural issues). Then knowledge and evidence-based publications have increased sharply and a steady and growing tendency to split everything has influenced the publications everywhere and also among killifish (notably with the emergence of the Brasilian researcher Wilson Costa who has described about 230 killifish names to-date in about 25 years). With these many many names we have a mirror of human life for any system (here a sound principle, to produce and respect evidence based data) that becomes emptied of its sense (perverted, may say some ironists) over time and, for example, Wilson Costa has (no critics, nothing personal against him here, just his strategy as a researcher) changed the picture of the old single genus Cynolebias (sensu Parenti, 1981) into at least 12 genera that were up-levelled from previous subgenera or created as atypical genera (Cynolebias, Austrolebias, Simpsonichthys, Hypsolebias, Nematolebias, Ophthalmolebias, Spectrolebias, Xenurolebias, Plesiolebias, Stenolebias, Maratecoara, Papiliolebias) some of them being further divided in several subgenera (e.g., Austrolebias in 7 subgenera), pending the next step of uplevelling these present subgenera to genera again, and similarly for Cynopoecilus and for Rivulus, while the publications to sustain these splits appeared more as preliminary steps into improving progressively a poor status of knowledge (in other words, proposed diagnostic characters appeared not solid enough or roughly analysed or too quickly translated into generic names). That is the main reason why Killi-Data has not followed the split of Rivulus and Simpsonichthys with new genera and may even reverse the picture in other also over-splitted groups, after new publications (and in parallel several scientific websites on fishes -not only on killifish- have just done the same). Indeed, the case of the genus Aphyosemion is emblematic because several subgenera had been described in the nineteen seventies and some authors have been tempted to up-level them as genera (e.g., Chromaphyosemion, Diapteron, Raddaella) and they even proposed it but they were poorly followed because nobody could handle the case of the subgenus Mesoaphyosemion that molecular data had clearly shown as heterogeneous (poly- or paraphyletic) and everybody knew that the morphology of all Aphyosemion was extremely stable (and ironically the single lineage that could be told apart, Raddaella fell close to Fundulopanchax by morphology, but not at all by DNA ! )… in other words it was not reasonable (and would have been harshly criticised) to split some subgenera into genera and leave Mesoaphyosemion untouched. As properly stated by Collier (2007) : a possible splitting of the genus in several genera is not advisable if the concept of genus proposed by him is followed ("If genera are to reflect phylogenetic history, two conditions must be met. First, all members of a genus should be descended from a single common ancestor. Second, all descendants of that common ancestor should be members of the same genus") and besides differences beween subgeneric lineages are not big too (as an additional argument) and besides, even more (cf. Pauciradius), they are not big between some subgenera of Aphyosemion and some subgenera of Fundulopanchax ! Why is it necessary to mimic molecular data to build in the genus Aphyosemion ? the not sharphy diagnosed subgenus Mesoaphyosemion, comprising species with average morpho-meristics is not monophyletic and needs further work. As a direct consequence, it appeared to the author (and previously probably to Collier who did not change the systematics of the genus apart from suggesting the inclusion of Episemion into it after his molecular results) that it was hopeless to produce a purely morphological tree from mainly measurable data (proportions and meristics) like it had been achieved for the Rivulins (Huber, 1999, 2012, Costa, 2006, 2011) or for the lampeyes (Huber, 1999, 2011). It was then decided to try to mimic the results of the molecular tree (Collier, 2007, and also Agnèse, Sonnenberg, Zentz, on more focused subgroups of Aphyosemion) by using morphological data and notably details of the live color pattern and to uniquely declare that option with a formal statement (although it cannot be said for sure that no researcher has not used molecular trees in the past in order to decide on which morphological data to use, none has formally declared it as such, to-date). 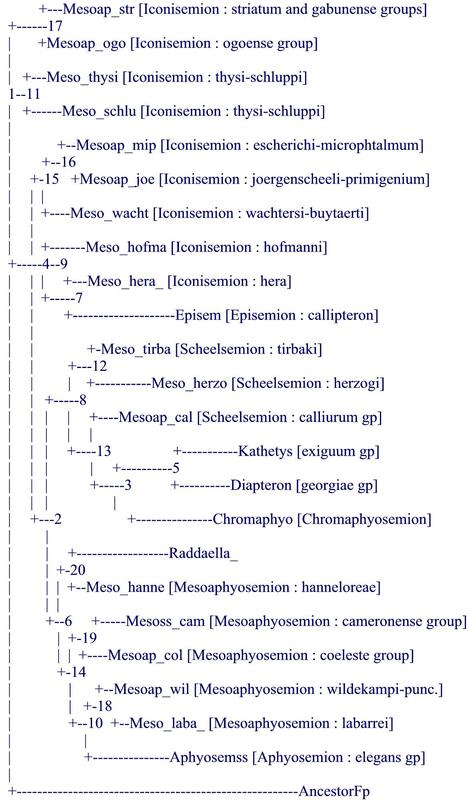 In addition, after Collier's work (2007), our knowledge was still left with a paraphyletic subgenus, Mesoaphyosemion, and with old diagnoses for all other named subgenera. It was then thought useful and fully in agreement with ICZN which requires formal diagnosis attached to generic levels, to try to mimic the molecular tree to develop new diagnoses for old and possibly new subgenera : that was achieved after the analysis of 91 characters (see the following morphological tree) but reviewers asked not to go further (notably on bootstrap values) because of the "a priori" conception of the tree, unlike previous works on Rivulins and lampeyes, also as computerized systematics. Not only the obtained tree was mimicing the molecular tree but it confirmed the position of the atypical species (point 4, above) and even helped to clarify the position of Collier's "orphan" species [note : several aquarists ask after comparing the present tree with Collier's tree about differences, e.g., about the relative position of Episemion subbranch not bordering that of Diapteron… this is only apparent because the computer decides where to place visually a subbranch relatively to its next subbranch, above or below, but the 2 subbranches can easily be reversed ("rolled") without changing the tree (see also the last paragraph on future studies)]. As a consequence, the new systematic definition of the genus Aphyosemion and its subgenera is fully congruent with present molecular evidence. It comprises 9 subgenera (for more than a hundred species) and it is fully homogeneous and stable. What are the impacts of the reshuffling of the subgenera of Aphyosemion ? notes : in the article the status of wuendschi as a subspecies of hanneloreae is questioned but not resolved (possibly closer to hofmanni ?) because the author has never seen that fish ; there is a minor copy-paste error in the publication : labarrei is listed in Iconisemion while it is clearly among Mesoaphosemion in its new restricted sense in the computerized tree, and also in the molecular tree (and the error has been corrected herein). Aphyosemion (Diapteron) abacinum	 A. (D.) abacinum	 valid sp. Aphyosemion (Scheelsemion) ahli	 A. (Sch.) [Sch.cal] ahli	 valid sp. Aphyosemion (Chromaphyosemion) alpha	 A. (Chrom.) alpha	 valid sp. Aphyosemion (Mesoaphyosemion) aureum	 A. (Mes.) [Mes.col] aureum	 valid sp. Aphyosemion (Scheelsemion) australe	 A. (Sch.) [Sch.cal] australe	 valid sp. Aphyosemion (Kathetys) bamilekorum	 A. (Kath.) bamilekorum	 valid sp. Aphyosemion (Raddaella) batesii	 A. (Rad.) batesii	 valid sp. Aphyosemion (Chromaphyosemion) bitaeniatum	 A. (Chrom.) bitaeniatum	 valid sp. Aphyosemion (Chromaphyosemion) bivittatum	 A. (Chrom.) bivittatum	 valid sp. Aphyosemion (Iconisemion) buytaerti	 A. (Icon.) [Icon.wac] buytaerti	 valid sp. Aphyosemion (Episemion) callipteron	 A. (Epis.) callipteron	 valid sp. Aphyosemion (Scheelsemion) calliurum	 A. (Sch.) [Sch.cal] calliurum	 valid sp. Aphyosemion (Scheelsemion) campomaanense	 A. (Sch.) [Sch.cal] campomaanense	 valid sp. Aphyosemion (Aphyosemion) chauchei	 A. (A.) chauchei	 valid sp. Aphyosemion (Aphyosemion) christyi	 A. (A.) christyi	 valid sp. Aphyosemion (Mesoaphyosemion) citrineipinnis	 A. (Mes.) [Mes.col] citrineipinnis	 valid sp. Aphyosemion (Mesoaphyosemion) coeleste	 A. (Mes.) [Mes.col] coeleste	 valid sp. Aphyosemion (Aphyosemion) cognatum	 A. (A.) cognatum	 valid sp. Aphyosemion (Diapteron) cyanostictum	 A. (D.) cyanostictum	 valid sp. Aphyosemion (Kathetys) dargei	 A. (Kath.) dargei	 valid sp. Aphyosemion (Aphyosemion) decorsei	 A. (A.) decorsei	 valid sp. Aphyosemion (Scheelsemion) edeanum	 A. (Sch.) [Sch.cal] edeanum	 valid sp. Aphyosemion elberti	 A. (Kath.) elberti	 = bualanum	 # valid sp. Aphyosemion (Aphyosemion) elegans	 A. (A.) elegans	 valid sp. Aphyosemion (Chromaphyosemion) erythron	 A. (Chrom.) erythron	 valid sp. Aphyosemion (Mesoaphyosemion) etsamense	 A. (Mes.) [Mes.cam] etsamense	 valid sp. Aphyosemion (Iconisemion) exigoideum	 A. (Icon.) [Icon.str] exigoideum	 valid sp. Aphyosemion (Kathetys) exiguum	 A. (Kath.) exiguum	 valid sp. Aphyosemion (Aphyosemion) ferranti	 A. (A.) ferranti	 valid sp. Aphyosemion (Scheelsemion) pascheni festivum	 A. (Sch.) [Sch.pas] festivum	 subsp. pascheni	 # valid sp. Aphyosemion (Scheelsemion) franzwerneri	 A. (Sch.) [Sch.fra] franzwerneri	 valid sp. Aphyosemion (Diapteron) fulgens	 A. (D.) fulgens	 valid sp. Aphyosemion (Diapteron) georgiae	 A. (D.) georgiae	 valid sp. Aphyosemion (Iconisemion) grelli	 A. (Icon.) [Icon.hof] grelli	 valid sp. Aphyosemion (Scheelsemion) heinemanni	 A. (Sch.) [Sch.cal] heinemanni	 valid sp. Aphyosemion (Iconisemion) hera	 A. (Icon.) [Icon.her] hera	 valid sp. Aphyosemion (Iconisemion) hofmanni	 A. (Icon.) [Icon.hof] hofmanni	 valid sp. Aphyosemion (Iconisemion) joergenscheeli	 A. (Icon.) [Icon.str] joergenscheeli	 valid sp. Aphyosemion (Chromaphyosemion) kouamense	 A. (Chrom.) kouamense	 valid sp. Aphyosemion (Chromaphyosemion) koungueense	 A. (Chrom.) koungueense	 valid sp. Aphyosemion (Episemion) krystallinoron	 A. (Epis.) krystallinoron	 valid sp. Aphyosemion kunzi	 A. (Rad.) kunzi	 = splendidum # = batesii # valid sp. Aphyosemion (Mesoaphyosemion) labarrei	 A. (Mes.) [Mes.wil] labarrei	 valid sp. Aphyosemion (Aphyosemion) lamberti	 A. (A.) lamberti	 valid sp. Aphyosemion (Scheelsemion) lividum	 A. (Sch.) [Sch.cal] lividum	 valid sp. Aphyosemion (Chromaphyosemion) loennbergii	 A. (Chrom.) loennbergii	 valid sp. Aphyosemion (Iconisemion) louessense	 A. (Icon.) [Icon.ogo] louessense	 valid sp. Aphyosemion (Chromaphyosemion) lugens	 A. (Chrom.) lugens	 valid sp. Aphyosemion (Aphyosemion) lujae	 A. (A.) lujae	 valid sp. Aphyosemion (Mesoaphyosemion) maculatum	 A. (Mes.) [Mes.cam] maculatum	 valid sp. Aphyosemion (Chromaphyosemion) malumbresi	 A. (Chrom.) malumbresi	 valid sp. Aphyosemion margaretae	 A. (A.) margaretae	 = christyi	 # valid sp. Aphyosemion (Chromaphyosemion) melanogaster	 A. (Chrom.) melanogaster	 valid sp. Aphyosemion melanopteron	 A. (A.) melanopteron	 = congicum	 # valid sp. Aphyosemion (Chromaphyosemion) melinoeides	 A. (Chrom.) melinoeides	 valid sp. Aphyosemion microphtalmum	 A. (Icon.) [Icon.str] microphtalmum	 = escherichi	 # valid sp. Aphyosemion (Mesoaphyosemion) mimbon	 A. (Mes.) [Mes.cam] mimbon	 valid sp. Aphyosemion multicolor	 A. (Chrom.) multicolor	 = bitaeniatum	 # valid sp. Aphyosemion (Aphyosemion) musafirii	 A. (A.) musafirii	 valid sp. Aphyosemion (Mesoaphyosemion) ocellatum	 A. (Mes.) [Mes.col] ocellatum	 valid sp. Aphyosemion (Chromaphyosemion) omega	 A. (Chrom.) omega	 valid sp. Aphyosemion (Chromaphyosemion) pamaense	 A. (Chrom.) pamaense	 valid sp. Aphyosemion pappenheimi	 A. (Chrom.) pappenheimi	 = loennbergii	 # valid sp. Aphyosemion (Scheelsemion) pascheni pascheni	 A. (Sch.) [Sch.pas] pascheni	 nomin. subsp. pascheni pascheni	 # valid sp. Aphyosemion (Mesoaphyosemion) passaroi	 A. (Mes.) [Mes.col] passaroi	 valid sp. Aphyosemion (Aphyosemion) plagitaenium	 A. (A.) plagitaenium	 valid sp. Aphyosemion (Iconisemion) primigenium	 A. (Icon.) [Icon.str] primigenium	 valid sp. Aphyosemion (Mesoaphyosemion) punctatum	 A. (Mes.) [Mes.wil] punctatum	 valid sp. Aphyosemion (Chromaphyosemion) punctulatum	 A. (Chrom.) punctulatum	 valid sp. Aphyosemion (Mesoaphyosemion) raddai	 A. (Mes.) [Mes.cam] raddai	 valid sp. Aphyosemion (Aphyosemion) rectogoense	 A. (A.) rectogoense	 valid sp. Aphyosemion (Chromaphyosemion) riggenbachi	 A. (Chrom.) riggenbachi	 valid sp. Aphyosemion (Iconisemion) schluppi	 A. (Icon.) [Icon.thy] schluppi	 valid sp. Aphyosemion (Diapteron) seegersi	 A. (D.) seegersi	 valid sp. Aphyosemion (Iconisemion) striatum	 A. (Icon.) [Icon.str] striatum	 valid sp. Aphyosemion (Aphyosemion) teugelsi	 A. (A.) teugelsi	 valid sp. Aphyosemion (Iconisemion) thysi	 A. (Icon.) [Icon.thy] thysi	 valid sp. Aphyosemion (Scheelsemion) tirbaki	 A. (Sch.) [Sch.her] tirbaki	 valid sp. Aphyosemion (Iconisemion) wachtersi	 A. (Icon.) [Icon.wac] wachtersi	 valid sp. Aphyosemion (Mesoaphyosemion) wildekampi	 A. (Mes.) [Mes.wil] wildekampi	 valid sp. Aphyosemion (Iconisemion) zygaima	 A. (Icon.) [Icon.ogo] zygaima	 valid sp. Why is it important to have dedicated one subgenus to Joergen Scheel ? On the contrary, modern researchers do not hesitate a single second to describe a new cryptic species name based on evidenced data that are just a consequence of Scheel's revolution with karyotypes, and that may go to the ultimate state where the difference between the new named cryptic species and the previously described species is so minute that both cannot be separated easily even on photos of the living male (e.g., Scriptaphyosemion wiseae, Simpsonichthys coamazonicus, etc., etc., those 2 examples being emblematic because each corresponds to a description of live fish nearly identical in all details to another species, but with "strong" -at least based on present techniques, such as molecular sequences- scientific evidence… again, no critics over those descriptions and describers, just facts). Is this situation good or bad ? How would have reacted the pionneer Joergen Scheel with this situation ? Are these new names really useful ? Are those modern researchers with modern techniques just applying Scheel's observations without any risk ? Will there be more and more described cryptic species without an end ? Will ultimately this mean that a population in Scheel's sense (that he wisely recommended to aquarists to keep separate from other related populations for breeding) end up with a species name (e.g., recently 5 populations of Scriptaphyosemion geryi were shown molecularly incompatible, not to speak about the multiple mixed populations of the Aphyosemion elegans superspecies in the Congo basin… or similarly of the Rivulus urophthalmus superspecies in the Amazon basin) ? Will this situation end up with an unavoidable destruction of the nomenclature ? (etc., etc.) Obviously I have no answer to those questions, but still let's believe that there is space, like Scheel always believed (and also any "true" researcher), for new research, new understanding to a biological complexity that becomes more and more complex and farther away while we attempt to touch it… with naming or with no naming, that is the question ! What could be done next ? Collier (2007) has rightly pointed the uneasy positioning of his "orphan" species, namely hera, hofmanni, in relation to callipteron (Episemion). The facts that all these 3 species are distributed in northern Gabon plateau, not far from each other geographically and that the whole area east of their known distribution in northern Du-Chaillu Massif of hills and small mountains is virgin of detailes collections probably explain those uncertainties. The future prospects for the improvement of our knowledge of the systematics of the genus Aphyosemion most probably lie in that region, all the more that it is precisely where speciation may have once started (at least for the basic lineages Chromaphyosemion and Scheelsemion) and that at its borders there are other atypical fishes without geographical phylogenetic known related counterparts (Plataplochilus terveri, Aphyosemion tirbaki, Aapticheilichthys websteri). Let's hope that entrepreneur collectors, notably passionate hobbyists, will start soon a detailed sampling of the region. Of course if it is not already the case, this is because roads for 4-wheels motors are not available, but there are roads for 2-wheels motors, and bikes with or without motors are fashionable again these days. when the version of your single tree is finalized (directly or through the concensus process), then you need to copy paste that tree in your MSWord file where your manuscript is being written… good luck ! As a final comment let's hope (idealistically) that one day in the future people, aquarists and researchers, work together in order to define smartly those characters and their states and derive diagnoses for all genera of Killifish ! Huber, J.H. 2012. Reappraisal of the Phylogeny of Rivulus and its Allied focused on External Characters. Killi-Data Series 2012, 9-25, 3 figs., 2 tabs. Huber, J.H. 2013. Reappraisal of the Phylogeny of the African genus Aphyosemion (Cyprinodontiformes) focused on External Characters, in line with Molecular Data, with new and redefined Subgenera. Killi-Data Series 2013, 4-20, 2 figs.